Finding meals that are healthy and appealing for kids is hard enough. Toss in a food allergy and it’s a whole other ball game. In fact, allergies now affect 18 percent of children in the United States, according to a recent Health of America Report from the Blue Cross Blue Shield Association. The study also noted a significant increase in severe allergic reactions in children due to food. According to the report, the most common foods prompting these allergic reactions are peanuts (22 percent), tree nuts and seeds (15 percent), and milk and eggs (6 percent). For parents of children with allergies, there are countless ways to steer clear of certain foods while still satisfying a child’s appetite and fulfilling their dietary needs. Check out the dietitian-approved healthy recipes below for a whole day’s worth of meal ideas. These kid-friendly recipes avoid some of the most-common food allergies found in the report: peanuts and tree nuts/seeds. 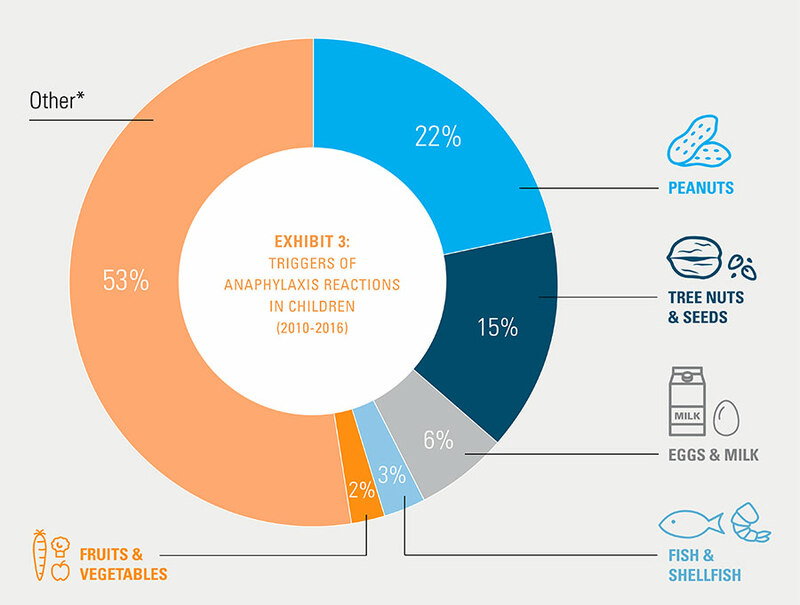 ER visits from severe allergic reactions to food and other allergens spiked 150 percent from 2010 through 2016, according to the latest Health of America report. (Image credit: Blue Cross Blue Shield Association). 2. Place array of rainbow vegetables on pizza crust. Cut into slices, serve and enjoy! Want something else than veggies? Try the Rainbow Fruit Pizza! 1. Position oven rack in the center and preheat oven to 400 degrees F.
2. Spray baking sheet with cooking spray to avoid sticking. 3. Drain, rinse and dry chickpeas thoroughly. 4. Mix oil and seasonings together. 5. Toss chickpeas in oil mixture. 6. Spread evenly in one layer on baking sheet. 7. Bake for 30-50 minutes until browned without burning. 8. Cool for 30 minutes and chickpeas will continue to crunch. Enjoy! 2. Form into 4-6 hamburger patties. 3. Cook on grill or in pan on stove until fully cooked and reaches temperature of 165 degrees F. Add gouda cheese on patty, if desired, while cooking, so it melts. Serve warm. 4. Serve with a whole wheat hamburger bun or as a patty with quinoa on the side. Enjoy! Kids and Vegetarianism: Is It Healthy?